This is only funny if you know that I'm thirty-three. Alas. When I was in my mid-twenties, I figured that someday I'd feel grown-up enough to have a kid. By my mid-thirties, I realized I was probably NEVER going to feel like a grown-up. Ever. Had a kid anyway. Seems OK so far. It's really nice to fall in love and find your "soul mate", but let me tell you something. Soul mates don't exist at all and marriage doesn't guarantee happiness or prevent couples from growing apart and being miserable. Often times you work extremely hard to keep a horrible relationship working, turn a blind eye on your partner's flaws, and end up living with the enemy. I can personally attest to this sad fact and for the 50% of couples nationwide that end up divorcing. And divorce is the nastiest and most painful break up you could ever experience, especially when there are children involved. So please don't buy everything they try to sell you. As cheesy as this sounds, you can only make yourself happy. So try hard to be happy with what you have now and your amazing talent. Gidget's got it: I don't think anybody's ever ready to get married, or ever ready to have kids. You dive in and do it anyway. Sometimes it works and sometimes it doesn't. Nobody ever feels like an adult. Everybody's faking it. Especially when it comes to kids, 96% percent of the job is bluffing and making it up as you go. No guarantees, but I think people who are basically kind and thoughtful tend to get better results. I love my boyfriend of 32 years - you know him. He carried my books to class and made sure he was around to walk me back to the car. Is he my soul mate? I don't even know what that means, but I love him more now today than ever. He is the big ole kid in our marriage and I'm the gru-mp (aka grown up). Doesn't matter. I only have today. Made a ton of mistakes yesterday so I'm not looking back. Just enjoying today! Love this cartoon and all of them! One of the awesomest things about having a kid is getting to do childhood again, from a different perspective. It's funny you should say that. 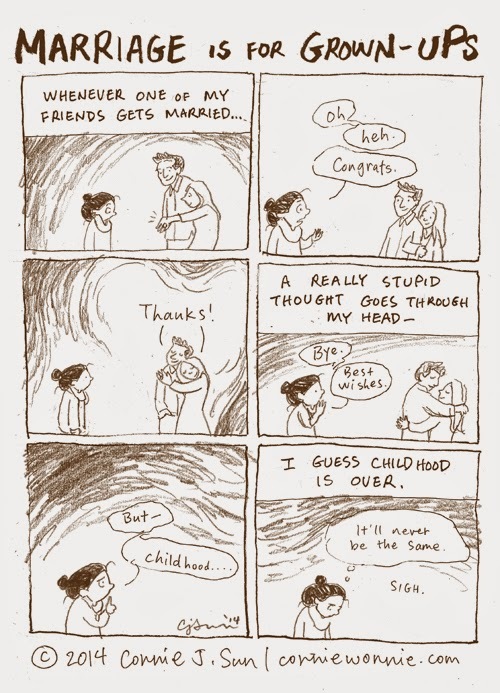 I never felt grown up enough to have a kid until I was in my mid-forties, and by then it was too late.